The next post will likely be late Monday or on Tuesday. Hook: any curved shanked hook. I add lead and a gold beadhead to aid in siking the fly to the bottom of the river. Stoneflies are found on the bottom, so keeping this fly down deep is a must. 1.) According to the forecasts, rain showers will gradually move into the region, becoming widespread by tomorrow afternoon. The rest of the week consists of highs in the 70's. The month of November looks to be above average for temperatures, then getting colder during the later part of the month into December. If you're like me and you're ready for some cold and snow, you may have to wait just a little while longer. Long range forecasting is nothing more than an educated "guesstimate". You can stab Jell-O to a tree before you can make a 100% accurate long range forecast. If you are anxious to know what may lie ahead during the upcoming Winter here in the state, this is about the best piece of information I know of... http://mattheweast.blogspot.com. Matthew East is one of our meteorologists in Charlotte. The top video is his newly added "2009 Winter Outlook". If you aren't familiar with technical weather maps and charts, don't worry, if you watch the end, he explains each month this winter in detail. (temperatures, snowfall, etc). I had to throw this out there, given that were diving into the colder months (eventually the winter months). 2.) Fishing will be on the good side over the next week or so. Warm temps will keep the fish relatively active (up high, it will be cooler). You can use just about any fly you want right now. For nymphs, Pheasant Tails, Copper Johns, Hare's Ear Nymphs, and most stonefly nymphs will catch fish. For dries, #18-24 BWO's should work, along with #16-18 Elk Hair Caddis, #14 Stimulators, and tiny cream midges. Streamers such as Woolly Buggers, Slumpbusters, Clousers, and sculpin patterns are also working very well, with the large browns lurking in deeper pools. In my opinion, this is the best time of the year to go fly fishing. Cooler temperatures combined with large hungry fish and red fall foliage make for great outings. 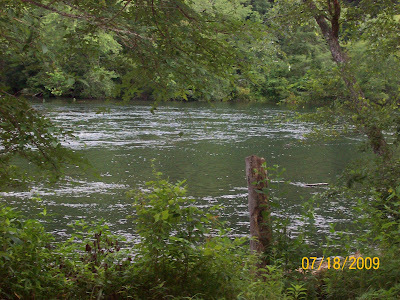 (from NCWRC website) RALEIGH, N.C. (Aug. 12, 2009)–Trout fishing opportunities provided and managed by the N.C. Wildlife Resources Commission have a substantial positive impact to the local economies of western North Carolina and to the state as a whole, according to a recent study conducted by Responsive Management and Southwick Associates. 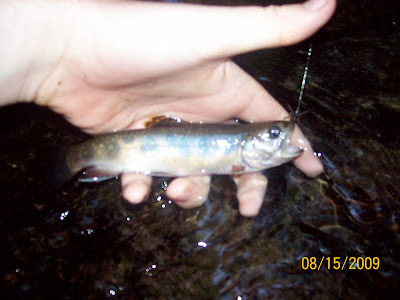 The study, “The Economic Impacts of Mountain Trout Fishing in North Carolina,” found that nearly 93,000 anglers fishing in North Carolina spent an estimated $146 million on mountain trout fishing trips and equipment in 2008. When the secondary (multiplier) effects of these dollars spent were factored in, the total economic output of the Commission’s trout management program in North Carolina exceeded $174 million. 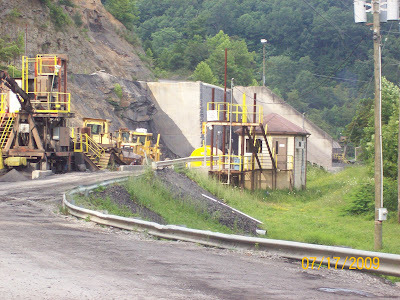 Money spent on mountain trout fishing in 2008 supported a total of 1,997 jobs and provided an estimated $56 million in income, much of it to workers in western North Carolina. From late March through early April, Responsive Management, a firm specializing in natural resource and outdoor recreation issues, conducted a telephone survey of 1,232 randomly selected licensed anglers 18 years and older who fished for mountain trout in 2008. Southwick Associates developed the economic models. The survey was funded by the Commission under the Federal Aid in Sport Fish Restoration program. Survey respondents answered questions pertaining to fishing trip and equipment expenditures, numbers of days fished and types of streams fished. 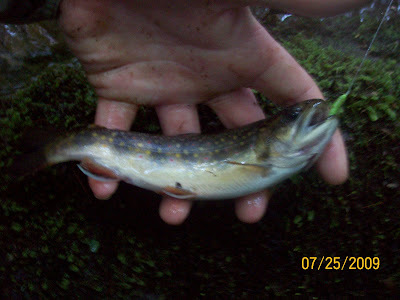 An estimated 92,765 resident and non-resident anglers fished for trout 1.42 million days in North Carolina in 2008, with Transylvania, Watauga, Haywood, Cherokee, Henderson, Jackson and Ashe counties seeing the most fishing activity. 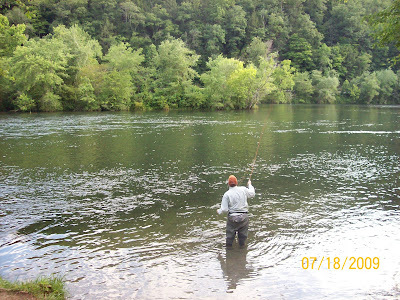 A typical resident trout angler fished nearly 10 days in 2008, spending $65 per day on trip expenses while a typical non-resident angler fished five days in 2008 and spent $158 per day on trip expenses. The average resident trout angler spent $502.92 per year on equipment. •Hatchery supported waters were the most frequently fished waters (625,147 days), followed by wild trout waters (422,671 days); and delayed harvest waters (374,611 days). •Total economic impact of hatchery supported waters measured $72.7 million; $55.2 million for wild trout waters and $46.5 million for delayed harvest. According to Doug Besler, the mountain region fisheries supervisor for the Commission, the agency funded the study to help quantify the economic impact of its trout management program on North Carolina’s economy. Survey results from this study, combined with results from an earlier angler opinion study, will be used to develop a comprehensive trout management plan, enhance public fishing opportunities, and market the agency’s angling opportunities to North Carolina residents and tourists alike. It seems as if winter is not going to give up without a fight. Low temperatures have been chilly by October standards statewide, as mid 20’s to low 30’s have ensued across the Old North State. Regardless of cold overnight readings, temperatures during the day have been relatively comfortable. Cold air is eroded by mid morning throughout this week, as temperatures rebound into the upper 60’s to low 70’s in most spots. Putting the weather into the fishing equation…The overnight temps may slow the trout down a bit, but they are still active right now. Big, spawning brown trout reacting to the colder water temps are in search of larger prey items to stock up for the colder months. This means streamer patterns such as the Woolly Bugger, Zonker, Sheila Sculpin, Sculpzilla, or even a Zoo Cougar are taking fish. Drift your streamer of choice through a “fishy” run, giving it a few twitches and short darts. If you are more of a dry fly kinda guy/gal, BWO’s are hatching in sizes of about 18-22 “ish”. 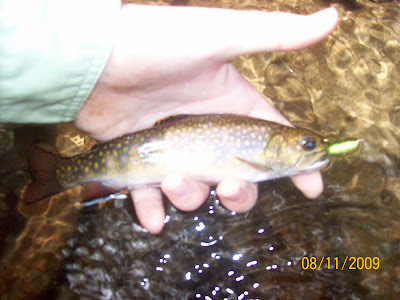 Stimulators and Elk Hair Caddis in “smaller than average” sizes are also enticing fish to the surface. Midges in small sizes (24-28) are also working. Delayed Harvest (DH) waters- The DH streams are doing well, following NCWRC’s stocking. These fish are more inclined to take most flies you put in front of them as long as it’s presented properly. They can be a little selective, but nothing compared to Catch & Release waters. Use just about any fly you want on DH waters…Nymphs to dries, streamers to wets…It’s your call. 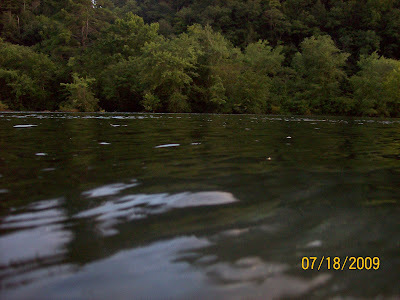 The “D” (Davidson River)- The hatchery section of the “D” has been fishing well lately. After the flooding rains we experienced a few weeks ago, the “D” looks like it’s been reconstructed on “Exstream Makeover: Riparian Edition (anyone? )… The hatches on the stream haven’t changed much. Midges, midges, midges… Blood midges, olive midges, black midges and cream adult midges are still on the menu for these fish. Try a thread midge in #22-30 or an olive WD 40 (#18-24). Light tippet is a must if you plan on catching fish on the “D” right now…2x isn’t gonna fool these fish around the hatchery. To sum it all up, everything looks great…water levels, temperatures, fishing, etc. …Have at it!! 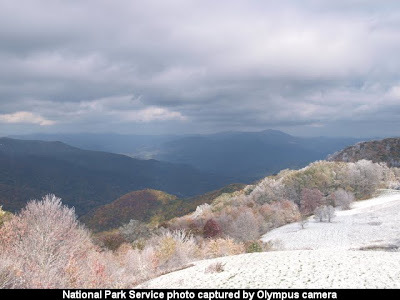 A snapshot at 4:00 from a NPS webcam located on the summit of 5,086 ft Purchase Knob in the Smokies. 1.) Chilly air is making it's way south into the Carolinas overnight tonight. Lows in the Piedmont will be down in the mid 30's with patchy frost likely (bring those plants in). Snow has been falling up in the mountains (mainly above 3,500 ft) during the latter part of last night into this morning. It's a little too early for snow, even on the higher peaks. It will gradually warm up as we progress into this week. By Wednesday, places like Boone will be in the upper 60's, possibly making it to 70. This definitely signals great fishing up in the high country. 2.) The fishing has been pretty good in western NC. If you can get past the cold, you should have a productive day. Look out for BWOs' in #16-22, along with small #20-28 midges. Stonefly nymphs in #8-12 have been working well, along with most generic nymphs (Pheasant Tails, Copper Johns, Hare's Ears, Red Fox Squirrel Nymphs). If you are more of a dry fly fisherman, Stimulators in sizes of 12-16 have been catching fish, along with a #14-16 Elk Hair Caddis or a #14-20 Para Adams. Don't hesitate to tie on a Pheasant Tail Nymph or a Copper John behind your dry of choice. Lastly, streamers (Zonkers, Buggers, Sculpins) will entice large spawning browns to eat. With that said, my Go-to fly right now would have to be a #14 pink San Juan Worm. They are highly visible to the fish and the angler and the fish seem to love 'em. 3.) We may hit a stream sometime next weekend or early next week. 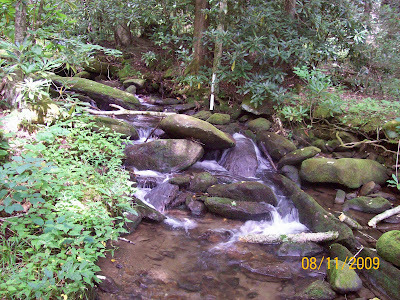 The Davidson River (The "D") may be the stream of choice, the Tuckaseegee or some DH water are also one of the choices. 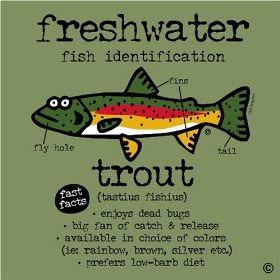 My Tennessee license/trout stamp expires next year...I need to get over to the South Holston/Watauga sometime during the winter. 1.) Judging by the forecasts, we're due to get smacked by some chilly, rainy weather tomorrow through Friday. It was around 80 degrees today here in the Charlotte metro area ahead of the cold front. Overnight the rain will slowly creep into the region, while temperatures slowly drop through the 50's. By lunch time tomorrow, the temps will continue to drop down into the upper 40's. By about 4 PM tomorrow, it looks like we'll be sitting in the mid 40's. The high temperature will be recorded early tomorrow morning, so albeit the Weather Channel forecasts a high of 52 or 53, it will be recorded before the temps start the plummet. Delayed Harvest is Finally Here!! Well, Stone Mountain was on fire today folks. The temperatures were in the mid 60's most of the day, with overcast skies. My kinda weather!! Water temps were in the mid 50's, which means wader season is here and wet wading can be eliminated until next summer. Most of the folks visiting the park were hiking and searching for wildlife. I did see a handful of other fisherman, but the pressure was low. 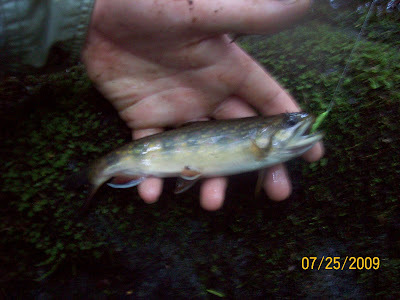 I was fisihng the East Prong Roaring River, where the recently stocked water gave way to excellent fishing. The fish (I'd say 90% of them were Brookies) were a little cautious about grabbing my fly, but that's what makes fly fishing fun. I ended up catching about a dozen, while missing literally 60-70 fish. They were rising to dries and taking small nymphs. One fish was unusually large. I saw him rising and tailing in calm, shallow water, only 10 inches deep or so. I tossed a #8 olive Slumpbuster streamer over to him and slowly stripped it in. Not too long after the fly hit the water, he swallowed the fly and I set the hook. Apparently he was a pretty smart fish, as he wiggled free and swam back down to his hole before I was able to bring him in. On 6x tippet and the absence of a landing net, I wouldn't have got him in close enough. (I didn't expect to hook up with anything big enough to need a net). My dad and I agreed he was probably 21-22 inches. 1.) Off to Stone Mountain tomorrow afternoon to take advantage of the recently stocked East Prong Roaring River. The Davidson River (AKA "the D") was another option, the Mitchell River was the next. It's going to be NICE tomorrow...Especially up in the mountains, with lower 70's for highs and mid to upper 40's for lows. The temps are ideal for trout right now. Not to hot, not to cold. I'm tempted to fish some wild trout water such as Garden Creek. Don't know if I will yet. I really don't care where I fish...As long as there's fish and I'm out of the "big city" of Kannapolis. 1.) I'm getting deeper and deeper into the planning of the upcoming stream restoration project for one of my classes (read the previous post for specifics). I'm meeting with our Director of Public Works and the Storm Water Manager of Kannapolis Friday afternoon, to discuss the plan, the possibilities and the limitations that could stop certain jobs (such as extending the section of the stream into private property) from being carried out. As you can see in these pictures there's a good amount of trash that needs to be picked up. With it being fall, we are transitioning from warm temps to cold temps. This means that I just have to slide my waders on when it gets into the lower 20's in November. If I would have chosen a fall garden, it would have been very risky, since the class started after the preferred date to start a garden. Roger's Lake Branch, usually freezes over night when temps get into the teens during the winter, so this may be the only problem. Last year, I was fishing Roger's Lake in early January with 13 degree temps early in the morning. Between navigating through sheets of ice and deep pools, I managed to catch several half frozen bluegill. 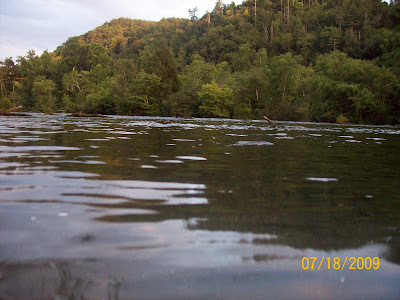 Found a thread/fishing report here on the Southeast Fly Fishing Forum that illustrates what the Davidson River looks like during 2,500 cfs flows...This is amazing...High water does make for some excellent streamer fishing. Leave the 6x in the car!! I need to get over there to try for a big one on 2x and a #4 streamer!! 1.) I can't for the life of me remember what the sun is. It's been cloudy and dreary for the past week or so. There was some sun on Sunday (Sun on Sunday...what a coincidence). I'm looking out the window now and all I see is gray skies. It hasn't been raining in the Charlotte Metro area, most of the rain has stayed west of us. It's like were living in the Pacific Northwest. We need rain...Not cloudy skies without precipitation!! It looks like the sun will dominate the day next Monday, but until then, cloudy and dreary skies will prevail. On the positive side of things, today is the first day of Fall. 10:34 AM marked the turnover from Summer to Fall. Next week looks cooler, according to the 15 day forecast. upper 30's for lows and 60's for highs. The best time to fly fish here in the state (especially for streamer enthusiasts) is in the Autumn months. 2.) I was able to fix the blog difficulties yesterday. I needed to renew the domain which only last annually. Lance Milks (his blog is here) emailed me yesterday because the blog was down. I checked and sure enough, "Tar Heel Fly Fishing" was now a random webpage/advertisement. It came to me that the domain has probably expired. I renewed it and an hour later the blog was back up and running smoothly. It scared me for a second, as I didn't know if it could be fixed our not. Sorry for the hold up, I'm sure some folks are thinking Tar Heel Fly Fishing is gone...It's not!! 3.) I checked the water levels which are VERY high in Western NC. The Davidson River is blown out. Currently it has receded back down to 1,010 cfs (I know what you're thinking...Receded?!?! To 1,010?!?!). Folks, average for the "D" is a mere 83 cfs. The water levels spiked to nearly 6,000 cfs yesterday evening. For a brief hour or two, the NWS Flood Stage was reached on the Davidson. Has anyone ventured over that way during all of the heavy rain? 1.) It's been pretty warm in the Carolina's today. Mid 80's prevailed across the Tar Heel State. It really wasn't bad weather wise, with relatively low humidity levels thanks to a dry air mass. The ten day suggests a pretty steady trend in the upper 70's and into the 80's. A wedge or two (cold air damming event) may disrupt consecutive 80's. If you're venturing out to the stream, river, or lake, low water will be a major problem. The Davidson River is flowing at 32 cfs, average to date is 89 cfs. 6x-7x tippet is almost a must in these conditions, so unfortunately 2x ain't gonna fly. Given the first frost hasn't "frosted" yet, terrestrials are still on the menu for most fish up in the high country. 2.) DH is starting back soon (October 1st). I'm ready for some delayed harvest fishing. 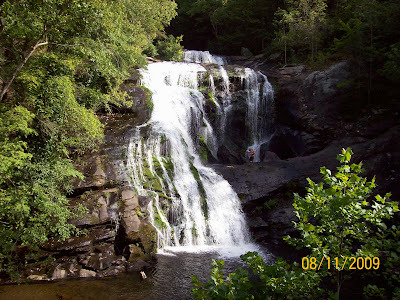 A friend of mine said he went up to Stone Mountain to fish one of the wild streams (Forgot which one he told me). He said he caught several smallish wild rainbows on dries. He and I agreed DH needs to start soon!! 3.) It's almost the 1 year anniversary of Tar Heel Fly Fishing. I posted the first post on September 20th of last year. It's been a fun ride in the Blogging world. I hope to keep the blog up and running for years to come. I signed up with Sitemeter back in roughly early January. Sitemeter tracks and records visits from folks. 4,612 visits and 7,496 page views, with a combined 12,108 visits/views since January. It's all because of the support and my readers, who keep coming back. Thanks again folks for a great first year...I've received countless emails from folks that really enjoy reading the blog. These emails keep the drive going. Thanks again folks! 1.) I've been on my toes the past few weeks. School has been taking away from the blogging world. Haven't had much of a chance to get away from it all. Projects and major assignments are now being assigned, which will take away even more blogging time. I've got an SAE (Supervised Agricultural Experience) project that's being planned out. I'm still not sure what to do, but, I'm thinking it will relate to fishing in some way, shape, or form. 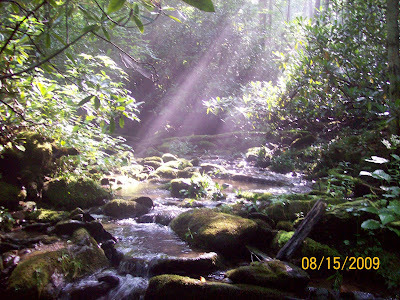 I've thought about heading back to the Smokies to help with the brook trout restoration project on Lynn Camp Prong. As long as the project pertains to wildlife, conservation or general agriculture it's accepted. Stream restoration on Irish Buffalo Creek which runs behind my house is another project. It's a real possibility, and would not be "just another science project". I would have to obtain permission through the county and the Soil and Water Department. I'll probably contact our local Trout Unlimited chapter here in Cabarrus County. If this becomes reality, I'll concentrate on restoring a section of Irish Buffalo, making it more suitable for the native bluegill and bass that inhabit it, and making not only the stream better, but the surrounding riverbanks and adjacent areas more suitable for other folks and for wildlife. Before and after pictures are a necessity for this project, which shows progress. So, I've got some work to begin in the coming days/weeks/months. My grandad who is a graduate of Baylor University down in Waco, TX, had tickets to the Baylor-Wake Forest game, so we all were up in Winston Salem for that game. 24-21, Baylor...It started out gruesome if you're a Deacs fan, but eventually winded down to a 3 point difference, which is not bad at all. If it would have been 65-3 it would have been pretty horrible. 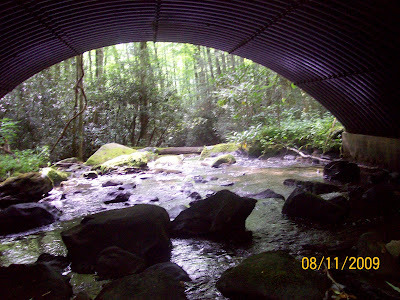 Just walked in the door from a 3 night camping trip at Elkmont in the Smokies. The first day and night (Tuesday) was not bad weather-wise. There was off and on showers, with a lot of low lying fog, but it was a good opening day for the trip. Wednesday was overcast and intermittently rainy, which is perfect for fly fishing. Wednesday night was pretty miserable, as a severe t'storm caused rain to pond under the tent. I've never heard thunder that loud before. It echoed across the valley and mountains. Scared the mess outta me... Anyways, the condensation from the heavy rain caused the inside of the tent to become soaking wet. We woke up to water all over the floors and the sleeping bags. Tents are usually able to withstand rain, but not rain falling at 2" an hour. Last night was a lot better, without rain and thunderstorms. Dinner...and gosh was it good!!! I took off to fish Little River under the bridge at the campground. Caught several small rainbows all on dries, all in the late evening around 7:45. Don't exactly know what this mayfly was. Looks like either a Brown Drake or a Mahogany Dun. Any aquatic entomologists with answers? The premier fish of the entire trip (heck the whole Summer!) I caught this guy between Metcalf Bottoms Picnic area and "The Sinks" on Little River. He fell for one of my #6 bright green caterpillar flies made solely of Furry Foam. The first cast was all it took. I saw a large white mouth open as my fly drifted through a deep run. I knew he had my fly so I set the hook and he let some rage out. I initially thought it was a large rainbow, because of the jumping this fish did. I've never seen a brown trout jump as high as this fella did. He cleared the water several times. I had to remind myself that this was trout on Little River, not tarpon at Boca Grande. Now, the size of this fish is nothing special on the South Holston River in TN or the Davidson River in NC. By Smokies standards it's a good fish. I've been glued to the Weather Channel and Jim Cantore's coverage on Tropical Storm Claudette (If you've been a blog reader here, you know that I'm into weather). 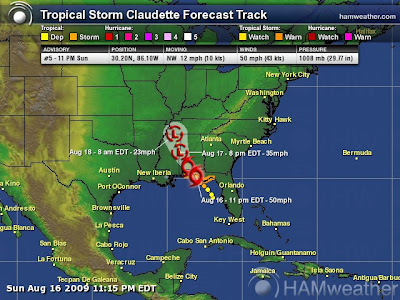 As of 10 PM, Claudette is a tropical storm. It's upon landfall as I type, so, not much room for this storm to intensify. It'll start the weakening process very soon. Albeit the storm is going to considerably weaken as friction from dry land wears the TS down, the heavy rain being thrown from the center of circulation will be a problem. Especially in mountainous areas. Not much to talk about w/ this one. Just a windy, rainy, dreary day out in the Leeward Island area. 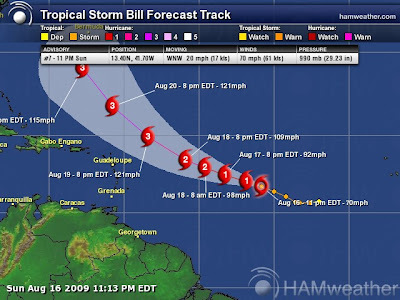 What really has grabbed my attention was Hurricane Bill. This mean, grumpy 'ol fella is really starting to churn out in the distant Atlantic. As of 9 PM (only 4 hours ago) Bill was at some 60 mph when I left for church around 6 PM. I just checked a few minutes ago and he's now up to 70 mph and dropped from 994 mb to 990 mb. Forecasters are expecting this angry storm to become a Cat 3 between Tuesday at 8 PM and Wednesday 8 PM. 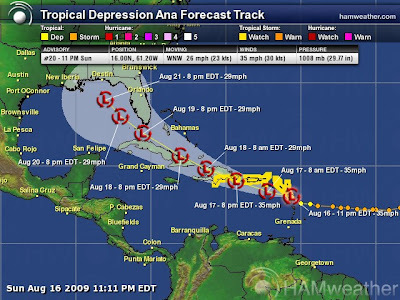 A Category 3 storm is considered a major hurricane. It's still uncertain (impossible to be sure) where Bill will head. Taken verbatim, the current storm track shows Bill hitting the east coast of the states, but where? Northern FL to New England are fair game as of now. I'm not thinking too far ahead. What does this mean for fly fishing/trout fishing in NC? We left Etowah, TN at 6:00 AM, bound for "Brookie Land". It was a pretty productive day, as we went to 2 rivers, each in seperate states. 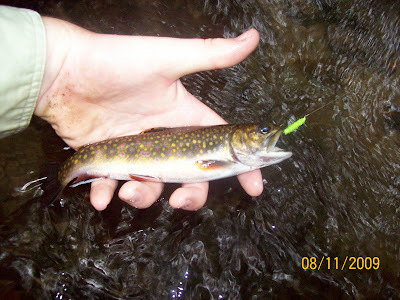 First, as mentioned above, we went to a Brook Trout enthusiast's dream stream.This place is packed with small 5-7" specs. 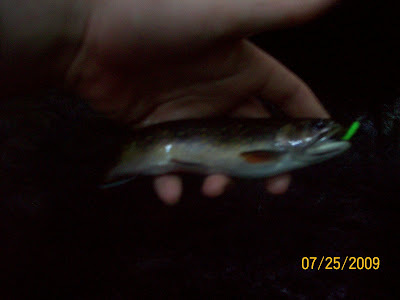 I caught several, before packing it in around 10:00, now bound for the Nantahala River in NC. The Nantahala treated me fairly today... caught several. I missed a 14" brown, who chased after my streamer and rejected it at the last minute. Like planned yesterday, I ventured out to my all-time favorite blueline: IAin'tTellin' Creek. Chock full of smallish wild Southern Appalachian Specs, this stream is not necessarily untouched, but it is still in the wild; away from the "big city lights" of Etowah, TN, away from major roads; it's away from people and it's a great place to spend the afternoon (or day) relaxing and unwinding. I rigged up my 4wt 6' fly rod, took a small fly box full of small dries and a few Green Weenies with me. 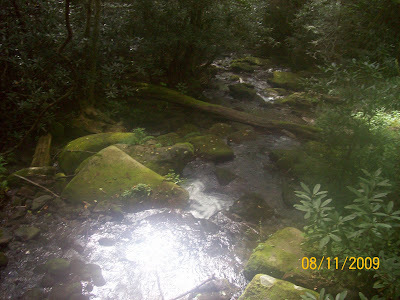 I set off into the jungle of Mountain Laurel and what can be an angler's worst nightmare, or best friend for the native fish, the rhododendron. In some places I had to "swim" through the tangle of these pesky shrubs. 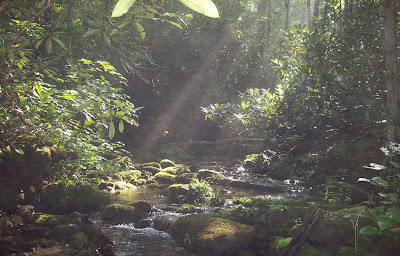 Throughout the short hike to the stream, I could here the mountain stream gurgling and rushing over stream rocks. Upon seeing the stream, I stopped and scouted for any liking looking hiding places for the fish. In short time, I located a likely looking pool. I positioned myself for a decent cast, while staying hidden behind a large boulder. The first cast of the day enticed a Spec to the surface, meeting my dry in a splashy outcome. I brought him close to my hand and while getting my camera out, he was gone. Perfect release in my book. I moved upstream to the next pool, where I caught several more. I managed to take a few pictures of a couple of fish, but instead of taking pictures of every single one, I sporadically took a picture throughout the day. 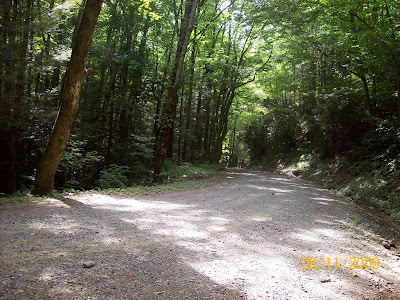 The gravel road leading up to the trailhead and the Cherohala Skyway. The stream as seen a top an old bridge. No fish were harmed and all were released. The one above darted off to his rock after I let him out of my hand. Off to the middle of nowhere tomorrow. IAin'tTellin' Creek awaits me tomorrow afternoon. Leaving around lunchtime tomorrow. The last post from IAin'tTellin' Creek is below the last few posts. An over abundance of smallish, but colorful and very eager Brookies makes this particular mountain stream one of my favorites. Last time I was there, I didn't see another soul, car, 18 wheeler whizzing around the roads, heck, didn't even see or hear any planes overhead. Peaceful's the word up there. The flora and fauna is unique and the air is cool, regardless of the 91 degree high temps down in the low country. Oh yeah, 100 fish days aren't remotely out of the ordinary on this stream. It's only 4 ft across, but it's definately filled to the brim with wild brookies. Time to tie up a few additional small dries, de-barb the hooks, and dust off my 4 wt 6 ft fly rod. I'll have pictures tomorrow. All and all, a good trip...I had several larger fish bump my fly, but no hook ups. Oh well, maybe next time... It was a good trip to unwind and enjoy being out on the river. 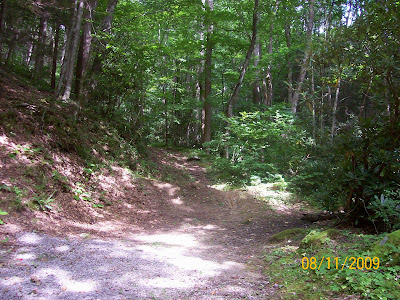 Still looking forward to a camping trip to the Smokies next week. Then, fishing will stop to a standstill with school starting back up. Heading out the door tomorrow at roughly 8:30 in the morning bound to Canton, NC. We've got a family reunion at noon. After that, I'll work my way over to Cherokee to fish the catch and release waters. I'll see what I can't get into over there tomorrow PM. Maybe I'll hook the last fish that got away from me last time I was there. As always when on the Cherokee C&R waters, I'm targeting Palominos. The camera's charged and ready to go tomorrow morning. Will post the results and a report tomorrow or Sunday afternoon. What is a trout again? It's been nearly 2 weeks since I've been on the river. Part of the reason is I'm back in Kannapolis until Thursday, then back to the Volunteer State for another 2 weeks. I then have a 3 night/4 day camping trip planned in the Smokies the week of the 17th. We've reserved a site adjacent to the river, so I'll be eating a quick dinner around 6:00, then catching the evening Yellow Sally hatches through dusk for those 3 nights. 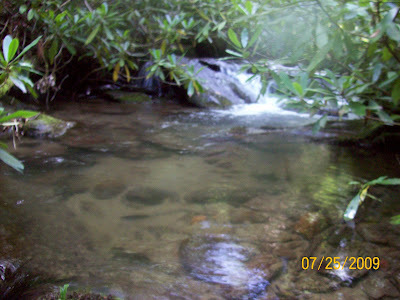 During the day, we'll try and get up to the Walker Camp Prong/West Prong Pigeon River to scout for some wild Brookies. Alum Cave Creek also looks to be in the cards, water levels permitting. Since we're in the middle of the summer and as I found out the hard way 2 weeks ago, the yellow jackets are out in full force. So, finding a way to deter them is a question I can't answer. Sometimes they are hidden, sometimes they are buzzing around the nest and it's obvious they're there. From what I've heard DEET has no affect on them whatsoever. DEET contains a strong odor which makes them increasingly aggressive. I've heard of wearing a pair of pantyhose when surfing in waters where Box Jellyfish and Portuguese Man 'o War (Was stung by one of these before...You talk about pain!!) reside. Talking about critters that sting and bite, Timber Rattlesnakes are more abundant this year. Copperheads too... Gotta watch for these as well... If you were to be bitten by a rattlesnake on the App Trail away from civilazation and medical facilities, it's a given, you'd be lucky to make it due to the potent neurotoxin venom. 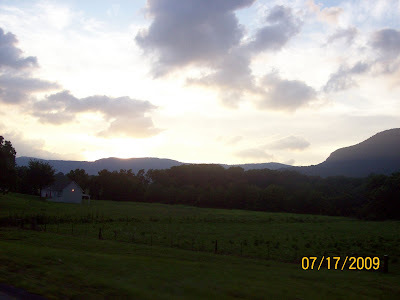 Enough rambling...Hey, I didn't put the heading entitled "The Viewpoints, Ramblings and Adventures, of an addicted NC Trout Bum up there for no reason... The next post will be posted from Vols Country. We left town at 6:00 this morning, bound to the North River area. 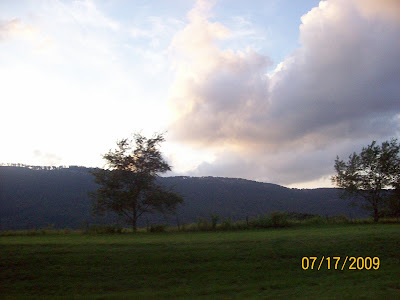 We grabbed some breakfast and drove on past Tellico Plains and Telliquah. Albeit it's Saturday, there weren't mounds of people on the Tellico this morning. We keep driving east towards the NC state line (roughly 3,200 ft or so in elevation). We followed the North River, which is fairly wide (15-20 ft in most places) but as you climb in elevation, the "river" turns to a small, rushing mountain stream. I actually fished one of the feeder streams to the North (IAin'tTellin' Creek). Very tight cover, but beautiful to say the least. It's been a while since I've been in such a pristine, untamed area such as IAin'tTellin' Creek. The first couple of casts yielded several wild So. 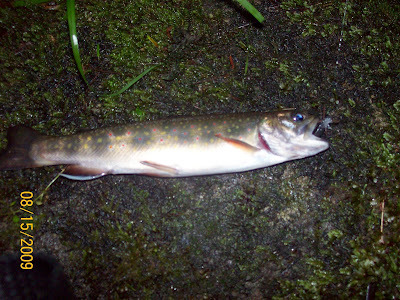 App strain Brookies. All where released unharmed. I got into a nest of yellow jackets while on the water...I honestly had no earlthly idea they were there until they started swarming around me, every one of them stinging me; on the face. Those little buggers are good at stinging the intruder in the face. They don't target the hands, legs, arms...but the FACE... Of all places... I'm now preoccupied for a while digging and removing stingers from my face. Luckily, I didn't have an allergic reaction, or I wouldn't be typing this post right now. My grandad has been an associate pastor for years. He has worked mostly in Texas, but North Carolina, Kentucky, and Tennessee have also been home to them. They lived in Middlesboro, KY 30 years ago. He worked as Associate Pastor at a church there in Middleboro. So, when he/we received an invite to see a play organized by the church on Friday, we jumped in the car and made the 2 1/2 hour trip north. 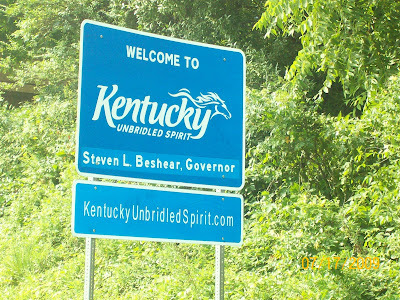 I've never made it to Kentucky until now, so I was able to mark another visited state off of my list. I've been to NC, SC, GA, FL, VA, TN, MN, WY, ID, MT, but a state as close as KY is to NC/VA, I don't know why I've never jumped from VA to KY and back. Now, AR, PA, WV, MD, etc are on my list. 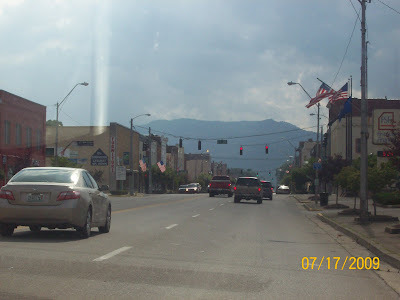 (above) The buildings here on Main St. were severely damaged after an EF 3 Tornado swept through town on May 9th 1988 causing $5,000,000 and $50,000,000 in damages. There was 1 fatality and 15 injuries.